Romney is named and quoted in this Daily article from November 18, 1965. In it, he details foiling Cal's planned Big Game pranks. Presumptive Republican presidential nominee Mitt Romney’s love of practical jokes has been well-documented: he’s admitted to playing “a lot of pranks in high school” and his family teased him for it on late-night television. As a freshman at Stanford in fall 1965, Romney put his pranking skills to work in service of one of the nation’s great college rivalries. In his one year at Stanford, Romney was very involved in the Axe Committee, tasked with guarding the Axe, which goes to the Big Game winner, and promoting school spirit. According to a Stanford Daily article from 1965, Romney, then an 18-year-old living in the freshman dorm Rinconada, went to the UC Berkeley campus on the night of November 16, four days before the 68th Big Game. Impersonating members of Rally Committee, Cal’s student support club similar to Stanford’s Axe Committee, Romney and two of his freshman dormmates successfully diverted the attention of Cal fans away from their original plan to paint Hoover Tower blue and gold. Romney, thinly veiling his identity by using the pseudonym Tim Yenmor, instead proposed stealing a wheel for the Stanford cannon. One dormmate who remembers the scene recalls that he made that wheel out to be far more sacred to the Stanford faithful than it actually was. After Romney’s efforts, security was stepped up around the Band Shack, where the cannon was kept, and precautions were taken to guard against some other pranks, or RFs, that Cal’s Rally Comm was planning. 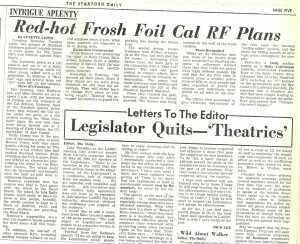 It’s not clear whether Cal students followed through with those plans. In their book, “The Real Romney,” authors Michael Kranish and Scott Helman discuss the events leading up to the 1965 Big Game. Referred to in the 1965 article as the “head of the Stanford special police force,” the young Romney apparently returned to Stanford with some vital intelligence before hitting the beat himself, guarding the Axe and the Lake Lagunita bonfire leading up to the Big Game. Edward Ngai is a senior staff writer at The Stanford Daily. Previously, he has worked as a news desk editor, staff development editor and columnist. He was president and editor-in-chief of The Daily for Vol. 244 (2013-2014). Edward is a junior from Vancouver, Canada studying political science. This summer, he is the Daniel Pearl Memorial Intern at the Wall Street Journal.